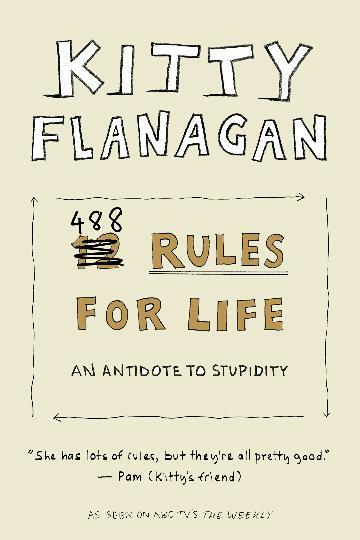 Kitty Flanagan is all about giving the people what they want, and it's become increasingly apparent that people want 488 Rules for Life. Ever since she appeared on the ABC's The Weekly with her segment about this 'pretend' book, she's been stopped in the street, approached in the supermarket, the cafe, even the dog park by people wanting to know where they could get a copy. At school Kitty was a small, stick-like child with very large front teeth and fuzzy hair. Nothing much has changed. After several attempts at university, studying things as diverse as Spanish, Poetry and P.E teaching, the government introduced HECS and the free ride was over. No more enrolling for a semester of tertiary good times then dropping out. Advertising beckoned because it seemed like the job that paid the most money for the least amount of qualifications. And for five years she masqueraded as a copywriter. Eventually she was fired. She doesn't know why and, more importantly, she doesn't care. So then she tried doing stand-up. And then she got a job on Full Frontal (a sketch show, not a nudie mag). And then she moved to London and did stand-up...heaps of it. There was another sketch show, an English one this time, cryptically titled The Sketch Show. And there was a short film that won a few awards. After that, she wrote stuff for the BBC and Channel Four with writing partner Julia Davis of Nighty Night fame. Then Kitty moved back to Australia where she is now probably best known for her for her regular Tuesday appearances on The Project and most recently for her role as Rhonda in Working Dog's Utopia on the ABC. She also has a segment on Charlie Pickering's show The Weekly. Aware that stand-up is like a sport that must be practiced, Kitty tours constantly.